We set out from Barra on the morning of Feb. 22, 2005 with our Guide Gerardo (Jerry) Kosonoy in his boat called the "Hakuna Matata".. Jerry K speaks fluent English and has proven to be an excellent guide. 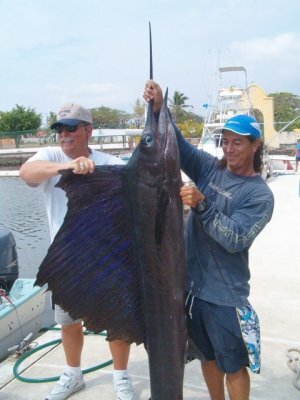 He can spot a sailfish tail fin at 100 yards. The party included Andy Jaeger from Arkansas, John Palko and his other friend John from Thunder Bay and Jerry McKenna from Lakefield, Ont. Although we only landed one sailfish, we saw and tried to lure at least four more, but they just weren't biting. We saw schools of small Marlin. I had one small Marlin on the line, but we lost it just before we could haul it in. Andy fought the sailfish Jerry K landed for at least 20 minutes. It was estimated to weigh 25 Kilos (about 55lbs). All in all, the day was extremely pleasurable. We saw Dolphins that came along side our boat. We also spotted a couple of sea turtles. Jerry K is well organized and knows his business. 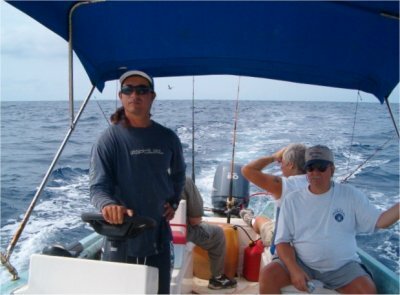 He provides a great deal of information about fishing and general information about the Barra/Melaque area. I join the others in the party in thanking Jerry K for an enjoyable fishing trip.